I’m taking theology classes to get my Bachelors and I have to submit essays after each course. I thought I’d post….. I loved this course Nature of God. At the conclusion of this second course, I feel like my Gospel language has improved as well as my ability to express myself with all that I’m learning about grace and the oneness of us and the Father IN CHRIST. This course topic coincided perfectly with my life right now. Specifically, with people, I keep bumping up against who are weighed down heavily in religious mindsets regarding the nature of God. It seems like everywhere I go I run into Believers who are begging God for healing, deliverance, freedom, etc. Not realizing that He’s already given us everything we will ever need for life and godliness. These same people will sit in Bible studies that teach an erroneous nature of God and that we are still bound to the law today because it is our standard of holiness. I was surprised and saddened that many people receive such a misrepresentation of God willingly, naively believing that a teacher must be an authority on what they’re teaching. And therefore, everything taught must be truth. Such a wrong belief regarding God’s nature has been an eye-opener for me because I wasn’t raised spiritually believing those things about God. I was taught from day one about the Christ life on the inside of me and that God is good and the devil is bad, period. This course rooted those early teachings stronger in me and unfolded revelation of the oneness I have, not just with Jesus and Holy Spirit, but with my Father. Getting the revelation that I was in His thoughts before the beginning of the ages was life-changing. It is a revelation that will forever mark who I am. Changing how I see myself and how I see others. It also transforms how I perceive or understand my Father. I always knew He was a good God. But as for the fatherhood aspect, I only thought He became my Father after I accepted Jesus. I thought that He was merely gracious enough to adopt me into His family because I now believed in Jesus. That before that He regarded me as an enemy because I was a sinner. And that His love and kindness, His goodness and grace towards me, could only begin after I accepted Christ. The truth is that He makes His sun to shine and His rain to fall on the just and the unjust, on the good and the evil. His grace and mercy have always abounded to ALL men at all times. Now I realize that He not only always loved me but had a dream for me before time began. I was never an enemy in His eyes. He has always been my Father from before the foundations of the world. My adoption is not adoption the way we here in the West see it but rather it is a position of sonship that He had prepared for me to walk in from before the beginning. He has always had good, kind, beautiful thoughts about me and towards me. There has never been a moment in time or before time began that I was not His. He doesn’t love me more now that I have been reconciled to Him. His love for me has always been there. Believing in what Jesus did merely awakens me to the realization of His love. To be free to realize how much He loved me all along. To begin experiencing the depths of that covenant love. He is my eternal Father. He wrote my DNA in my mother’s womb. And my DNA is His very DNA. He was always fully persuaded about me. His faith saw me IN CHRIST before I even knew anything about Christ. He was so confident in my ability to remember where I began! Then He irresistibly drew me to Himself, waking me up from my slumber to a life of union in Him. Also through this course, I learned that Jesus’ death was not a penal substitution. Realizing that His death was not to satisfy God’s anger with humanity. Nor was it to appease God so that He would finally be willing to consider me or even glance in my direction. No, Jesus was my Father’s passionate pursuit of me! He came to reveal the Father and show us what we look like redeemed and walking in fellowship, in oneness, with Him. Jesus didn’t go to the Cross alone. The Father was in Him on the Cross reconciling the WHOLE world to Himself. Restoring the relationship that He had designed for all men to have with Him. Jesus was the last Adam. Adam’s single transgression resulted in the condemnation of all men. Jesus’ obedience equaled righteousness upon ALL men. His death redeemed humanity and forever removed any distance with the Father. What God has always known to be true about us carries more authority than any evidence that could condemn us. ALL judgment was taken away through that ONE sacrifice, ONCE AND FOR ALL. The secret of the power of the Gospel is that He succeeded in redeeming all of mankind. 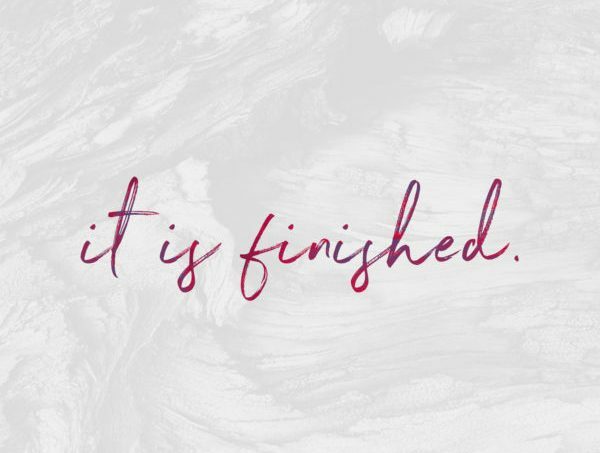 It was a perfect redemption, not when we believed it, but from the finished work of the cross. We are now once again free to be His sons. We may have lost our way for a while, but we always belonged to Him. Like the lost coin, we never lost our value and ownership. In Christ God came to celebrate our original value. We were made in the image and likeness of our Daddy. He is the blueprint of our design. To see Jesus is to see the Father. Likewise, to see me is to see the Father. The days of distance are over. We are now free to live as He designed us. No longer distanced from the Father, but alive in Him. Jesus showed us the Father’s heartbeat in the parable of the Prodigal son. His father was not disapproving and saying “how dare you come back after you wasted the family name.” No, the father was dancing and rejoicing. He was celebrating the son with no hint of shame, rebuke, remorse, regret, or inferiority. So it is with our Father. He joyfully celebrates over us with praise. Zephaniah 3:17: The LORD your God is with you, the Mighty Warrior who saves. He will take great delight in you; in his love, he will no longer rebuke you, but will rejoice over you with singing.” Celebration of us and over us is our Father’s heart. He rejoices over us with uncontainable joy, singing, dancing, leaping and spinning around with great delight! Can you see it? Can you hear it? Why is He so joyful? He is celebrating His oneness with us. We cannot be any closer to God than we already are. There is no pressing in on our part. Honestly, I would’ve been grateful just to be accepted by Him and given a place in heaven someday. It would’ve been more than enough for me just to know that level of security. But that wasn’t enough for my Daddy. His dream for us was BIG. It was much bigger than I would have ever dared dream. He desired that I would be filled up with ALL the fullness of Him (Ephesians 3:19). And then He made that a reality for me IN CHRIST. His fullness, His completeness is tailor-made for our human design. He is 100% at home in us. He likes who we are, who He designed us to be. He made us in His image and likeness. He finds such beautiful expression through us. Colossians 2:9 says that God finds an accurate and complete expression of Himself, in a human body (Mirror Translation). And verse 10 tells us that Jesus mirrors our completeness and endorses our true identity. He is “I am” in us. Colossians 1:19 says The full measure of everything God has in mind for mankind indwells him. What a joy to live this life filled with the fullness of the Spirit without measure. What delight to have all the fullness of God in our human body. To live our lives in oneness, in intimate fellowship, in Him. For that fullness, that Living Water to overflow out of us to this world around us. The more I know Him, the more I begin to know myself. I can’t know myself apart from knowing Him. He defines me, and my nature is rooted in His nature. 2 Peter 1:4 says that we have been given great and precious promises that through these we may be partakers of His divine nature. We were created as a partaker of His divine nature. These great and precious promises were given to us reveal His image, His likeness and His dominion so that in that understanding we could discover our image, our likeness and our dominion. That is what Jesus came to reveal. And Jesus is the revelation of the Father. A true revelation of the Father enables me to understand Scripture correctly as well as accurately understand the communication of Holy Spirit. My victory in life is proportionate to an accurate image of God. The only way I can accurately understand God’s nature is to look at Jesus. He revealed the Father to us. He said if you’ve seen me, you’ve seen the Father, We are one. We won’t understand the Old Testament Scriptures if we don’t understand their oneness. John 1:17-18 says For the Law was given through Moses; grace and truth came through Jesus Christ. No one has ever seen God, but the one and only Son, who is Himself God and is at the Father’s side, has made Him known. No one rightly understood God or perceived Him correctly until Jesus came and unfolded Him to us. The ministry of Jesus was a rehearsal of the goodness of God. He rehearsed it over and over in everything He did and said so we would get it right. He came so that we would know what the Father looked like and what we looked like walking in oneness with Him. He told Phillip if you’ve been watching everything I’ve done you’ve seen the nature of the Father. In everything He did He was always revealing the goodness, kindness, and love of God. God was not a hard man. That was a disabling perception that was erased by Jesus. In the Old Covenant they were living in a fallen world, and so they were continually ascribing characteristics and qualities to God that were based on their observations and experiences in a fallen world. They presented Him as hard, angry, distant, disinterested, and wrathful. Although we no longer live in a fallen world, we can still walk in a distorted “fallen” mindset. A way of thinking that defines God based on our experiences and disappointments in life. Seeing Him vastly different then we see Jesus. Seeing Him as disappointed, judgmental, condemning, and punishing. But Jesus showed us the heartbeat of Abba. He revealed to us that He is not at all hard to please. He is not against us. Rather that He is passionately for us and with us and in us. Everything about Jesus is the expression of the true nature and character of God. To know the Father we need only to observe the life and ministry of Jesus. We aren’t to interpret God by looking backward to the law or through the prophets, the Fall, sin, etc. Instead, Scripture calls upon us to understand the Father ONE WAY ONLY — according to the Biblical revelation of Jesus. He’s given testimony of Himself through Jesus. He’s spoken to us in these last days by His Son. The Father and the Son are one. There is no division. John 1:18 tells us that Jesus was in the bosom of the Father. The Jerusalem Bible translates it as nearest to the Father’s heart. It is “kolpos” in Greek and is an intimate expression of co-union. The prophets and Moses in the Old Covenant didn’t accurately perceive God at any time. But Jesus was in the bosom of Abba. He was one with the Father, sharing a single heartbeat. This co-union was a picture of our co-union. We have an intimate union with the Father as Jesus did. He was an example of us. We have the mind of Christ. We have the thoughts, feelings, and purposes of His heart which is also the Father’s heart. Their heart is the same. To see what that single united heart looks like, we need to become intimate with Jesus of the Gospels. We are to observe how He dealt with sinners, the sick, and the oppressed. Regarding how He felt about the hopeless and the shepherd-less masses we get to know not only His heart, but the Father’s. We are to take notice of His thoughts on pharisaical religion, with its legalism, it’s self-pity, and it’s burden of works but all along KNOWING that He loved every Pharisee. We are to hear His words to the Sadducees, who didn’t believe in the supernatural and understand that again He loved every Sadducee. He spoke to them with all the love and compassion He speaks to you and me. His voice of love and compassion is exactly the Father’s voice towards humanity. The Father doesn’t lay heavy burdens on us. He’s a good Daddy. And in Him, there are rhythms of grace. Jesus had an unforced relationship with the Father. An unforced union with Him. Jesus simply walked from this place of union and life. And the life He shared in the Father, naturally flowed out of that. Miracles, signs, wonders, relationships, love, all unforced rhythms of His Father’s grace toward us. It’s really that simple. James told us be “doers” of the Word. Religion has used that Scripture to keep us bound in our outward performance. Telling us that if we “do” what the Word says we will not be self-deceived. And yet living a life bound to managing my behavior is in itself deceiving. If we read on in verse 23, James tells us that a doer is one who looks in the mirror and sees his true self. Doer is poiétés in Greek. It’s where we get our word poem. The Father is the Poet. He has a poem that He has written for each of His children. He wants you to look into the face of Christ until you see yourself so clearly that what you see inspires spontaneous expression. As that happens, my life becomes a living expression of the poem that He wrote before time began. The poetry of His unforced rhythms of grace revealed in me. My life becoming a living expression of The Poet.